As much love as he has for the Los Angeles Lakers — the team he played 20 seasons for before retiring from the NBA in April — Kobe Bryant isn’t obligated to don the purple and gold at all times anymore. Especially not on his feet. Tuesday marked Bryant’s 38th birthday, and as a special present, Nike unveiled a new pair of the future Hall of Famer’s signature shoes. The colorway of the sneakers? Not purple and gold. All-black? I mean, he is the Black Mamba, but no, not quite. 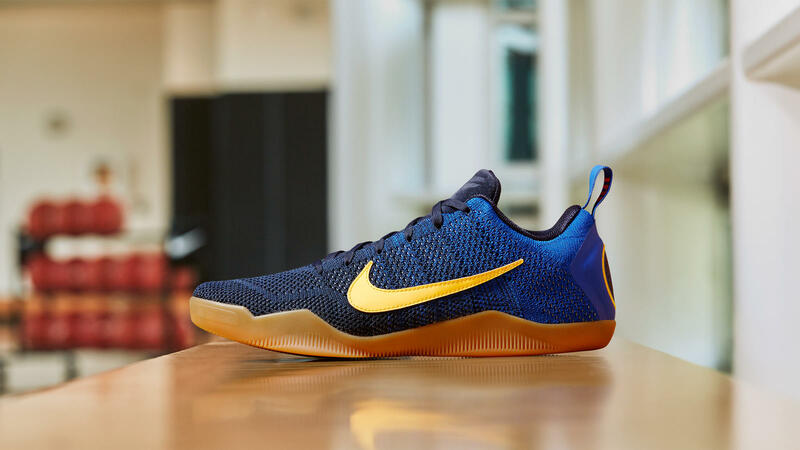 Bryant’s new sneakers — the Kobe 11 Mambacurial, which drops Sept. 8 on Nike.com — are blue, gold and red, paying homage to perhaps his favorite team in the world — FC Barcelona. For the past few years, Bryant has been planting seeds of his love for soccer in his signature basketball sneakers. For the past few years, Bryant has been planting seeds of his love for soccer in his signature basketball sneakers. In 2013, he released both the Kobe 8 System “Barcelona” colorway, his first sneaker tribute to the Spanish club, as well as the Kobe 8 Mambacurial colorway, which was modeled after the Nike Mercurial Vapor IX soccer cleats. Now, it’s hard not to picture Bryant spending his newfound free time juggling a soccer ball in the Kobe 11 Mambacurials. Or firing off some penalty kicks like he did at a Manchester United-FC Barcelona game in 2011. On Wednesday, the city of Los Angeles will celebrate Kobe Bryant Day. But if it were up to Bryant, there’d probably also be a celebration in Barcelona, Spain.